Total newness captured this season from the top 10 brands with the largest assortment counts in the luxury segment was recorded at 3,876 items. Prada led the pack with 685 items (refer to Chart 1). The brand also had the highest new-in rate at 65%, supported by strong full price sell-out rate at 64%, proving high demand with no signs of slowing down. 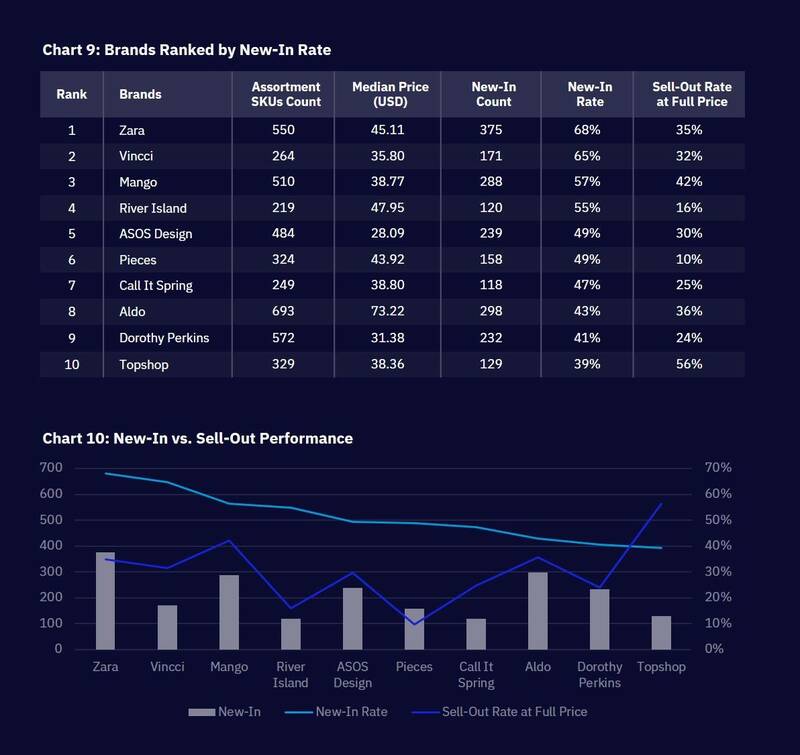 Prada and Miu Miu topped the chart with more than 60% new-in rate respectively, despite the latter having 2x lesser assortment SKUs count with a relatively low sell-out (refer Chart 1). Miu Miu’s youthful aesthetics might have failed to appeal to shoppers, as the rest of the brands ranked were more sophisticated yet positioned within a similar price range of above USD 1,000. 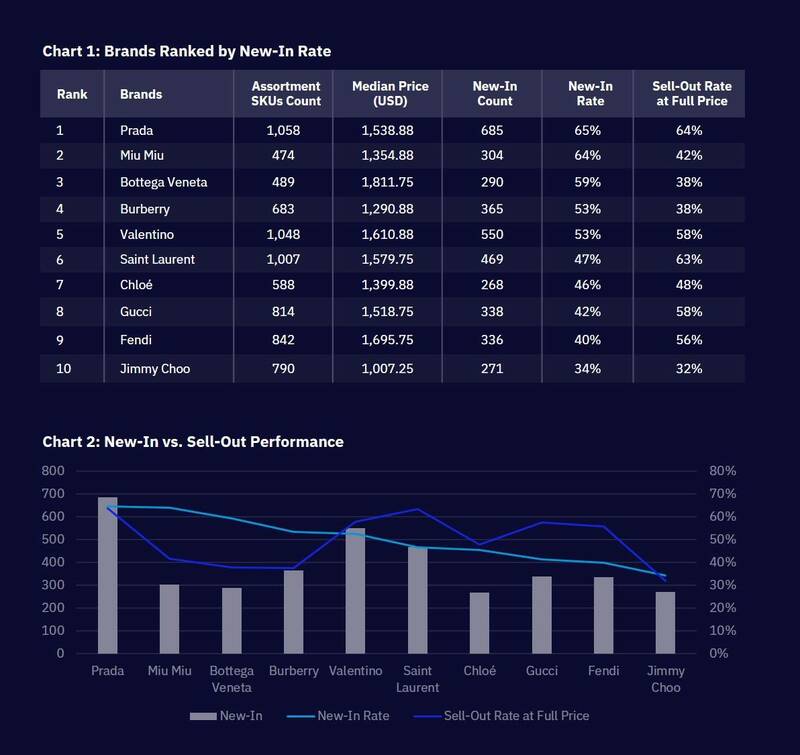 Saint Laurent, Gucci and Fendi greatly outperformed sell-out rate against new-in rate respectively, suggesting missed opportunities (refer Chart 2). Valentino and Chloé performed well in the season with sell-out rates marginally exceeding new-in. Valentino, typically celebrated for its couture dresses, crept up with the 2nd largest bag assortment this season. The brand continues its success with Rockstud collection, first debuted in 2010 with celebrities like Jennifer Lopez and Olivia Palermo seen sporting accessories from the collection. Newness launched this season was driven by Crossbody and Totes which contributed 48% to total new-in. 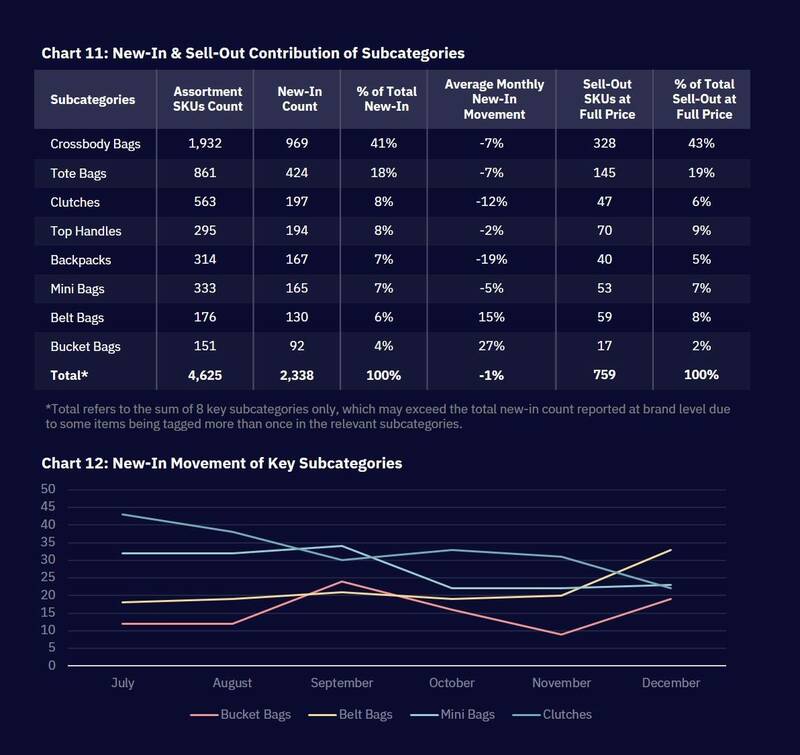 Despite only contributing 6% to total, Bucket Bags recorded the highest average of newness injected month-on-month. The Mini Bag trend was prominent on the runway this season, also showcased on the 2019 catwalks – from the miniature necklace bags to the ‘90s shoulder bags. 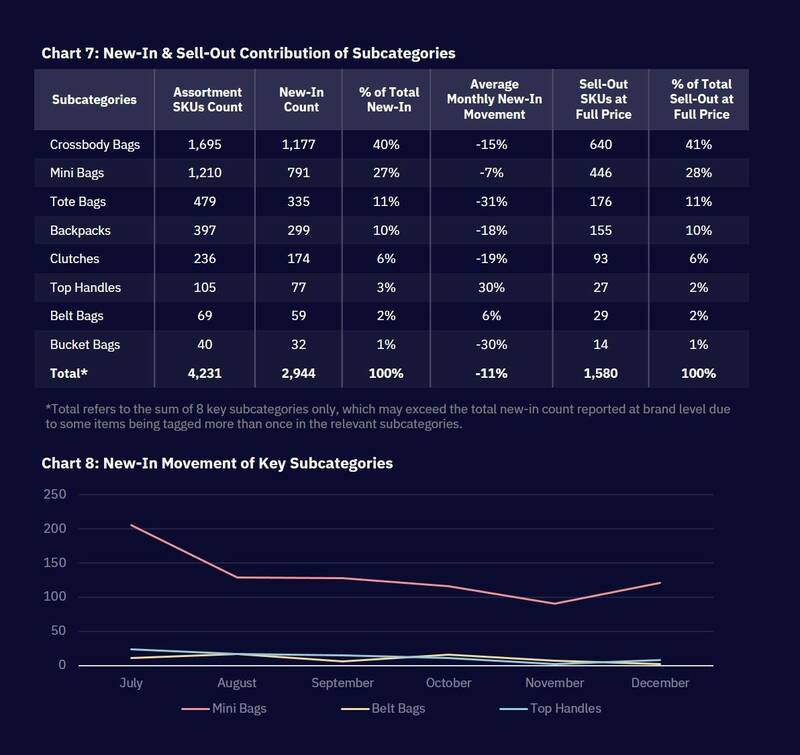 The stable monthly movement and high sell-out contribution sealed its popularity among the consumers (refer to Chart 3). Belt Bags enjoyed a style revival although its new-in numbers were not as high as other subcategories. Celebrities like Kendall Jenner and Kaia Gerber were among the driving forces of the popularity, which validated its near balanced sell-out contribution against new-in. Crossbody Bags, a style that was not so much influenced by fads, remained most popular among consumers as sell-out rate outperformed new-in. Overall, major style trends spotted from the new-in assortments in this segment showed a full return to the ‘80s and ‘90s era across the leading brands and subcategories. 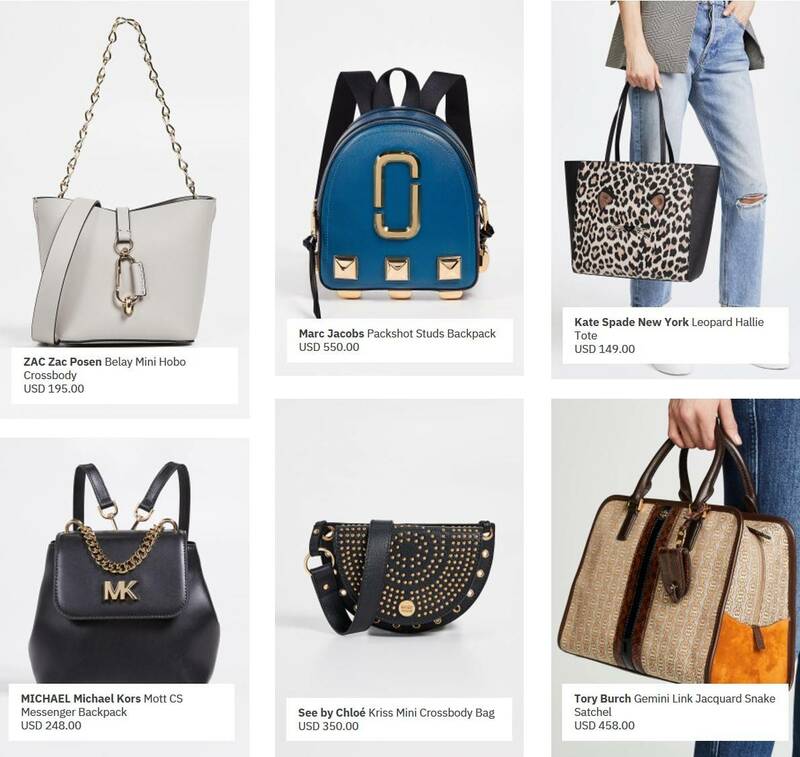 More than 900 new-in SKUs (more than 20% of total new-in) sported the edgy bike-lock chain style and was prevalent especially in crossbody bags, mini bags and clutches. The Logomania trend saw a surge in popularity across bags as more than 800 newly launched SKUs were heavily decked with logos, giving this ‘90s style a major return. Another trend spotted this season included croc-effect handbags – an injection of luxe and polish look to anyone’s wardrobe. Total new-in for the premium segment in this season was recorded at 2,434 items. Rebecca Minkoff topped the list with 492 items (refer Chart 5). However, on productivity, Coccinelle trumped with over 83% newness supported by equally strong full price sell-out rate at 85%. Coccinelle’s strong performance could be credited to its affordable price point and the appeal of its simplistic design. 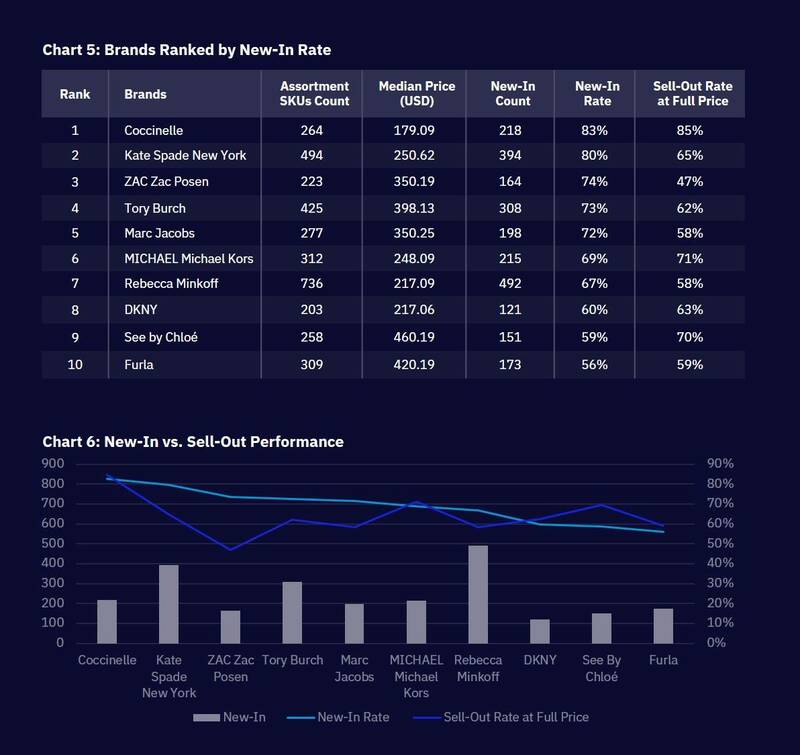 MICHAEL Michael Kors, DKNY and Furla also performed well with sell-out rate marginally surpassing new-in rates (refer to Chart 6). Though having a high sell-out is ideal, See by Chloé showed signs of missed opportunities with limited newness yet garnering a whopping 70% full price sell-out rate at a much higher price range (2x higher than its counterparts). On the other extreme, ZAC Zac Posen recorded the lowest sell-out despite its strong newness, presumably still lacking on brand awareness for its accessory line, as it is more recognised for its primary namesake label, Zac Posen. Kate Spade New York, Marc Jacobs and Tory Burch saw a huge gap between new-in rate and sell-out despite having launched a high number of new-in products during the season. The new-in products launched by the premium brands were mostly comprised of Crossbody Bags, which contributed to 40% of total new-in. Most top 5 subcategories, however, showed a declining trend in the monthly new-in movements, indicating slow stocking on trending styles among the premium brands. Mini Bags indicated a strong key style that transcended from the luxury segment as its sell-out marginally outperformed the new-in launched, signalling a decent performance. 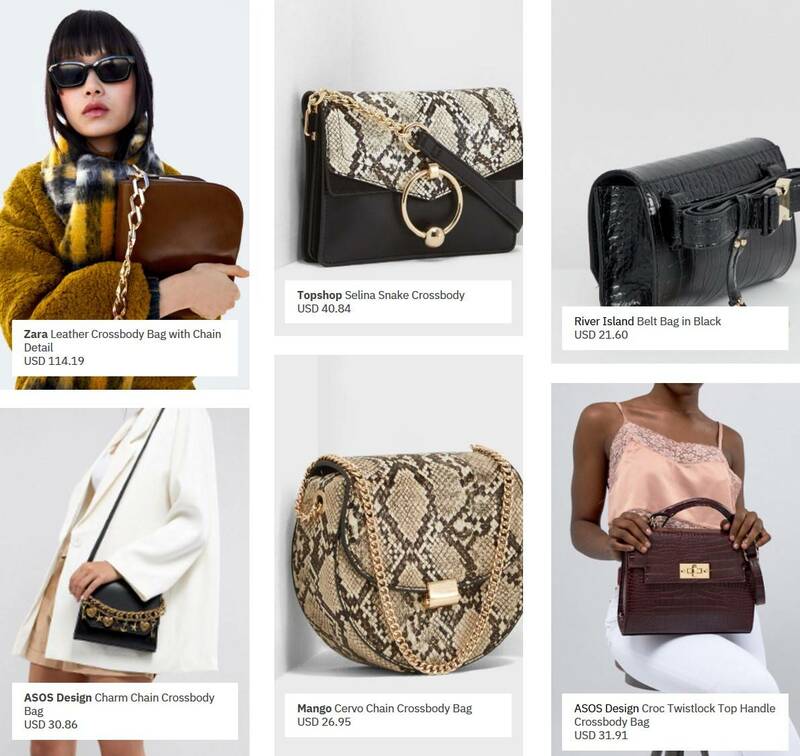 Despite having a low volume of new-in, the Belt Bag trend proved to be popular as its new-in contribution matched its sell-out contribution, plus its positive monthly new-in movement signified that it was trending during the season. Top Handles showed an increment towards the end of the season, possibly indicating a key style that would continue to be popular in the next season. Overall, major styles spotted from the new-in assortments in this premium segment showcased boldness and edgy styles. Chunky chains made an appearance in this segment too but were more understated compared to the ones showcased by luxury brands. The design element was incorporated mostly in crossbody bags, mini bags and tote bags. Flashy gold hardware was also incorporated in the form of logos, bag closure, studs and handles. The key trend in apparel spotted this season – the animal prints such as snakeskin and leopard print, also transcended into bags as the new-in assortments saw a surge in this print across the bags subcategories. 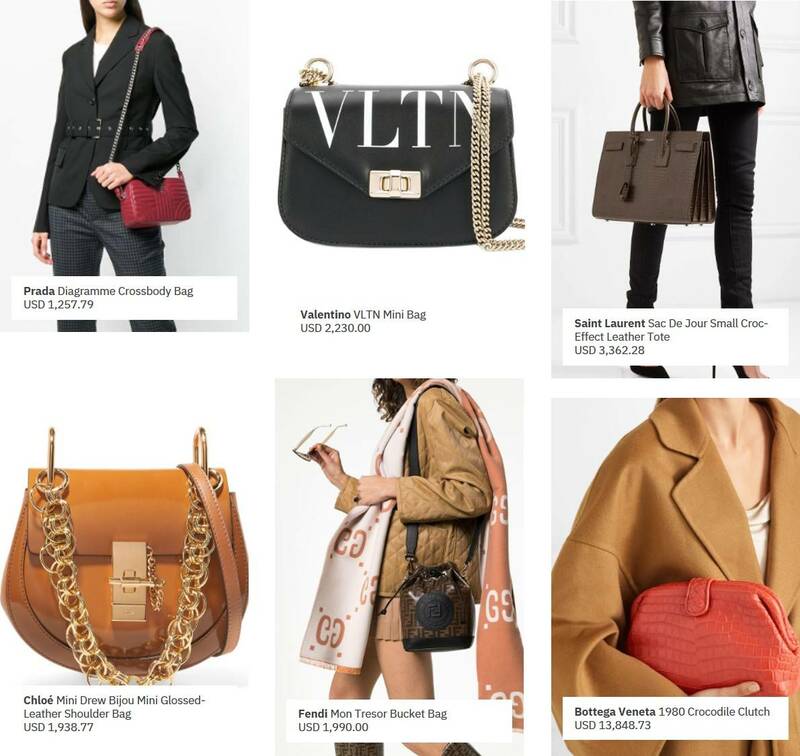 Total new-in bags captured from the top 10 fast fashion brands during the season was recorded at 2,128 items. Zara led the pack with 375 items (refer to Chart 9). Though the brand had the highest new-in rate at 68%, it failed to achieve a comparable sell-out performance, recording only 35% sell-out at full price. All brands performed poorly over the season with the exception of Topshop. It was the only brand that achieved a strong full price sell-out that outperformed its new-in rate (refer to Chart 10). However, the huge gap between the two metrics also signified a missed opportunity for the brand. Aldo, a brand known primarily for its shoes, nearly achieved a comparable performance between its new-in rate and full price sell-out. Its bags are highly coveted since it began launching more designer-inspired handbags that mimicked the likes of Chloé’s Drew Bag and Danse Lente’s Johnny Bucket Bag, leading to a significantly higher price point (89% higher than average of its counterparts). Zara and others in the rank observed a huge gap between their new-in and full price sell-out, despite having launched a relatively high number of new-in products during the season. The overall sell-out rate (both full price and discounted) however was at a much higher rate (70%), suggesting that fast fashion brands relied heavily on discounts to push sell-out. 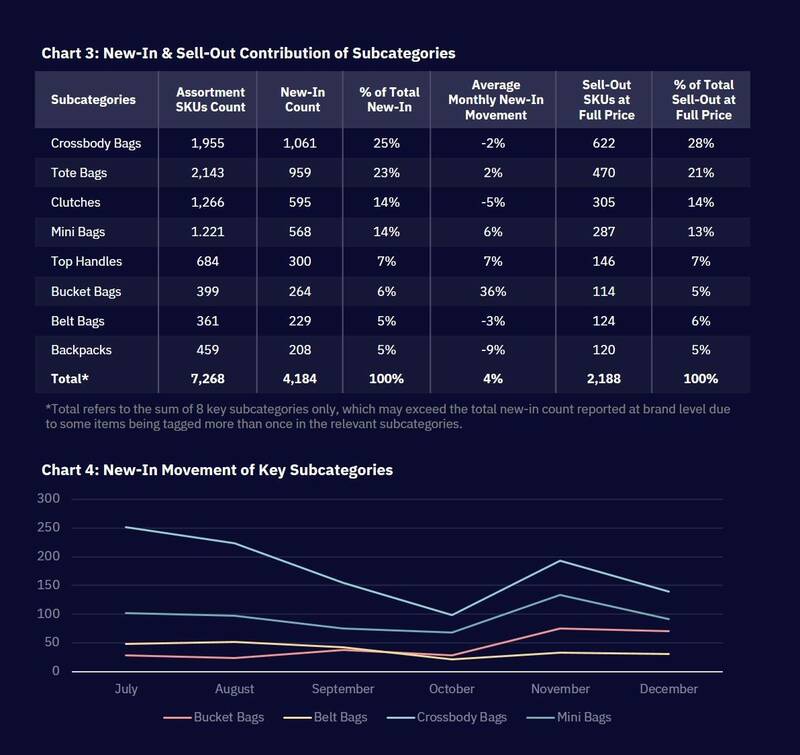 Similar to the luxury segment, Crossbody and Tote Bags were the main contributors of newness launched this season, accounting for 59% of total new-in (refer Chart 11). Bucket Bags showed a sign of continuous popularity as the subcategory recorded the highest average of newness injected month-on-month, indicating a possibility that it would remain relevant in the next season. Belt Bags also showed an upward trend. Nearly half of the new launches in this style got sold out at full price, signifying high appeal among consumers. Zara, Mango and Topshop were among the brands that contributed to the sell-out of this style. Mini Bags had a matching new-in vs. sell-out contribution, further strengthening the ‘it’ bag status of the style this season. Clutches on the other extreme failed to perform as only 24% of the newly launched products were sold out at full price. Overall, major styles spotted from the new-in assortments in this segment showed a similar pattern as the luxury segment, except with more offerings in animal prints. More than 300 new-in SKUs sported the chunky chain style and was commonly found in crossbody bags. The popularity of animal prints especially snakeskin was even more prevalent in the fast fashion world as there were more assortments with snake print launched during the season. Price Factor: Product pricing is crucial in generating sales as well as creating demand. However, does low price entail higher sales on bags? From the different segments analysed, this condition seemed to hold true – especially for fast fashion brands. Consumers have grown accustomed to the rigorous discounting strategy launched, especially over the holiday sale during Fall/Winter season. Designer houses, on the other hand, naturally target consumers with higher income, the price serving more as a measure of a brand’s value and image. This is evident with most luxury brands recorded high full price sell-out rates. Premium brands tend to struggle with balancing luxury quotient over price. Most try to position themselves on the upper end of the ‘affordable luxury’ spectrum but fail due to multiple product promotions and distribution issues. Style Interpretation: This season’s ‘it’ bags such as mini, belt and bucket bags were prevalent across all three segments while crossbody or sling bags remained more of a staple style. The dissimilarity, however, could be seen on certain styles translated from luxury to fast fashion – the chunky chain trend was more extravagant and elaborate in luxury brands while premium and fast fashion interpreted it in a much-understated manner to cater to the masses. The luxury segment also saw a resurgence of visible labels and logos (logomania), all over the bags’ exterior and even on straps. This trend, however, was less prevalent in the premium and fast fashion segments. Evaluate Positioning: It is key for brands to understand their current position, especially against competition, to enable strategic decision-making. With sell-out not catching up with frequent newness, the fast fashion brands faced overstocking issues, which resulted in heavy discounting to clear out stocks. To avoid landing in a similar situation, brands should be more proactive in examining and re-assessing their positioning periodically to remain relevant and competitive. Understanding Consumer Demand: As brands keep tabs on runway trends and the growing significance of social media buzz, it is more important to understand own consumer demand or when targeting a new group of consumers. Simply adopting the latest styles without the target consumer in mind or without research, will lead to costly lessons learnt. Consider again, why chunky chain and logomania were less prevalent in the fast fashion segment while trending successfully in the luxury segment.